I’m in the process of learning how to weave. As I’ve worked my way through the learning curve, the phrase “weaving a story” has taken on a whole new meaning. 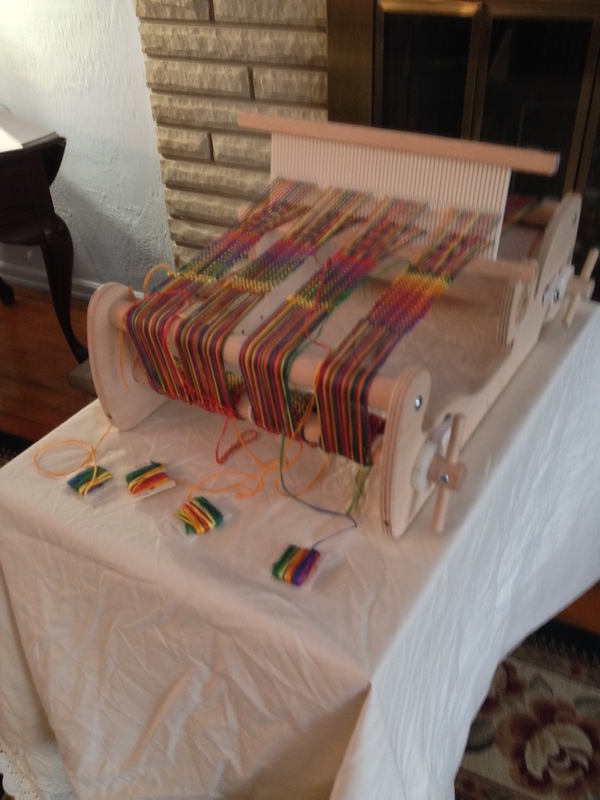 If you’ve never tried weaving, here are some of the highlights. • The longest and most intense part of the process is in the preparation. • No matter how careful you are, threads will get tangled, sometimes hopelessly, forcing you to cut them out. • Threads will twist when you least expect it. • If you don’t press hard enough on the beater to keep the rows close together, you’ll end up with holes in your work. • It’s easy to get confused as to which way you’re working, especially when you have to stop and pick up your work later. • When using a variegated thread (as I am), you don’t know what the finished product will look like until you’re finished. Starting a new project fills me with excitement and anticipation. Sometimes I get to a point where I’m tired of the pre-process and just want to get to the writing. If I skimp on my research, character development, or plot line, it’s not long before I get stuck. Having to stop and do more research, brainstorm new ideas, or sit down and have a heart-to-heart with my main character ultimately takes longer than if I’d taken the time I needed in the preparation stage. I love my words and stories. I can go off on tangents or fill my manuscripts with words and scenes I think are beautiful and marvelous. But when I objectively look back, I discover a tangled mess. The only solution, painful as it is, is to cut out the sections that do not contribute to the story. Even with all the planning in the world, my story occasionally takes an unexpected twist. At times, this can add dimension and design. Or, I may find myself trapped in a dead end. Then I must retrace my steps to where the twist happened and fix it. I need to work consistently on a project. When I continuously pick it up and put it down, I lose that momentum that causes a story to flow. That leads to holes in the plot, disappearing characters, and forgetting where I was headed in the first place. At times, like during NaNoWriMo, it can be fun, invigorating, and refreshing to just write, not knowing how it will turn out until the end. While this approach does contain some risk, the story may end up being worthwhile, or a piece whose value is contained in the practice and the process. Either way, the joy is in the journey. I’m convinced that whoever coined the phrase, “weaving a story” must have been both a weaver and a writer. The parallels are inspiring. So, if you’ll excuse me, I need to get back to my weaving . . .